Put a group of people in a room. Give them a whiteboard, pens, and markers. Ask them to develop an idea. Put the same group of people in another room. Give them pipe cleaners, Play-Doh, a stage, a guitar, and LEGO. Ask them to develop an idea. How different will the ideas be that emerge from the two different rooms? In other words: How do the tools we use determine what we come up with?… or whether we engage at all. It’s a question worth asking – in addition to location, time and venue. Perhaps our people fail to come up with new solutions or ideas because we always ask them for those novel ideas in the same meeting, in the same place, in the same manner, and using the same tools. In one of the People and Business Management workshops that I facilitate we ask participants to outline how they would approach their first meeting as the manager of a multicultural team. I’m always pleasantly surprised by the imagination and inclusiveness of the responses. They require thorough preparation that people rarely do anyway – via Getting Real. 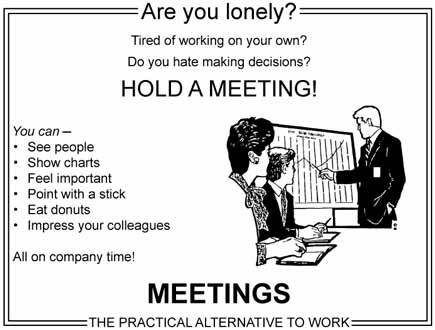 If you absolutely MUST have a meeting, follow these rules. Never have a meeting without a clear agenda. Set a 30 minute timer. When it rings, meeting’s over. the only stupid idea or suggestion is the one that is not shared. So, go ahead, by all means… be stupid! during which participants will likely be multitasking on their blackberries and iphones… NYTimes.com.